In keeping consistent with the other 2014 pre workout reviews that I have done thus far, I will rank the product on four key areas: the products taste, its profile, its performance, and its value, followed by the overall final score (out of ten possible points). In addition, I have added a new category for this product, going over the label and packaging- because after all, looks are what matter most! 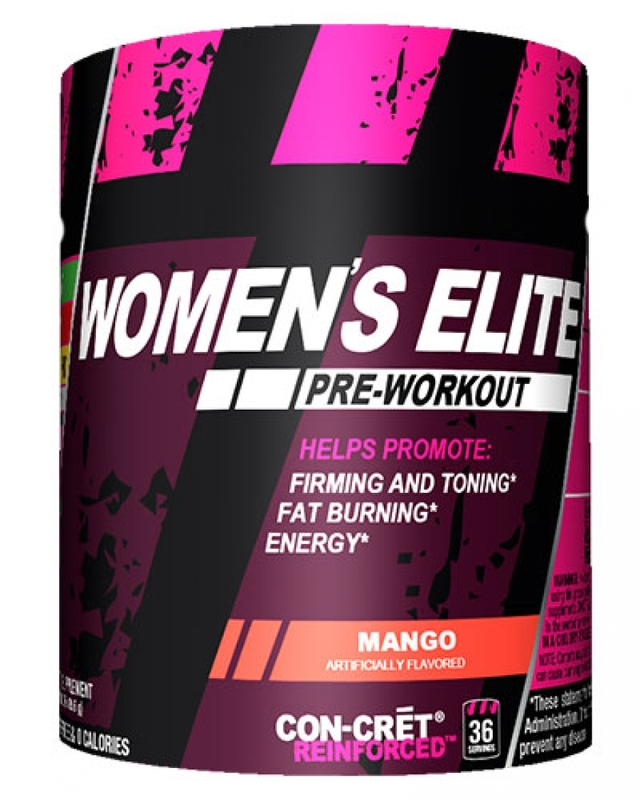 Ordering Women's Elite from Promera's website, you have two choices for flavors: Mango or Strawberry-Kiwi. I have to give some props to Promera for this. While two flavors isn't an extensive menu by any stretch, the two that they do offer are pretty distinct. They went a little outside the box of usual suspects such as fruit punch, or lemonade, or blue raspberry (which is always disgusting IMO). I ended up going with mango, because, well, its now cold outside and I wanted a tropical flavor to remind of the beach (and its only December!). The mango flavor is honestly pretty terrific. It has just the right amount of sweetness for me. As my readers know, I am pretty finicky when it comes to the sweetness level, and this product delivers the perfrect amount. The mango flavor is about as authentic as you can get in a powdered drink mix- it reminded me a little bit of the ocean spray 'island guava' juice. Yes, you know the one I'm talking about. Love that stuff. Promera gets a very well-deserved 9.3 in this department, because I am looking for perfection, and this is close, but not it. I also wouldn't mind seeing try to use some natural sweetener instead of the standard sucralose. Although, this product doesn't have too bad of an artificial sweetner taste, which also contributes to its high score on this aspect. While taste is certainly important, the more important components of the mixture are the active ingredients- and this is where I have to really lay into Promera.First of all- the serving size is a MINISCULE 1.3 grams. or those of you who don't know how small that is- think of like half of a sugar packet, and that's what we're dealing with here. My issue with this is that no matter WHAT you put into this formula- it's just not going to be effective at 1 tiny gram. Unless this was a nootropic formula- or something with some very serious stimulants, there is just no excuse for this small of a serving size. As for what comprises the 1 gram of goods- it is just three things. First is, of course, the patented Con-cret form of creatine (creatine HCI, discussed above). 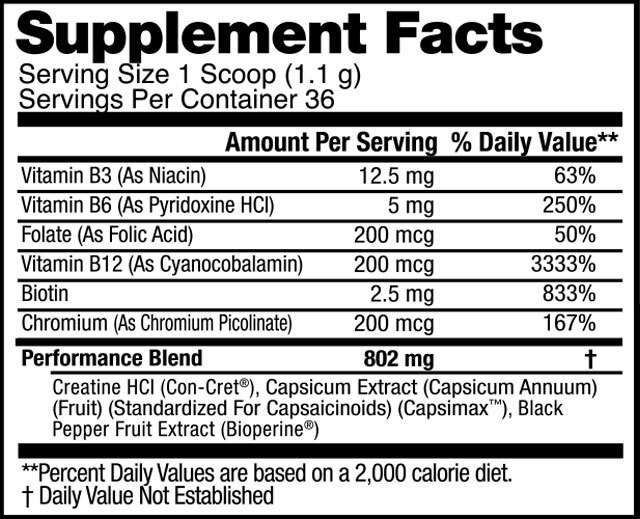 The second ingredient is Capsicum, and the third is Capsimax (black pepper extract).These latter two ingredients are semi-new thermogenic ingredients- designed to elevate the metabolism and provide a fat-oxidating effect. This is clearly where Promera put at least some thought into formulating for a women's audience. On whether or not a pre-dominantly creatine based product will resound with a female audience- the market will tell them, but I have my doubts. And the reason is this: creatine will cause water retention. I don't care if it's instantized or hydrochlorized or cocaine-ized. The nature of the beast is that you will add some water mass. You'll have a more full, less 'dry' or 'lean' look, and that's just what it is. If you've taken creatine products before, you know I'm speaking truth. Now that being said, there is a measly dosage of creatine in each serving. Think about it - the whole serving size is a gram- even if creatine is the heaviest hitter of the three (which I assume to be the case since it is listed first), there still won't be much more than a half gram of creatine per serving. In summary, I'm not sold on this formula because it is very barebones, and is essentially just a simple creatine product. The performance of Promera's Women's Elite pre workout is probably its most redeeming quality. I must caveat this statement by saying that it performs well under a very specific circumstance. What I mean is that this product is great for one thing, and one thing only. And that is moving weights. I knew that this creatine-based product would serve me best for low-volume, heavy-resistance training. If you think about how creatine works in the body- you can see that this makes tons of sense. Creatine is muscle cells very first source of energy for short, explosive movements. The creatine stores however, are easily depleted, and that is why we supplment with this product- so that there is a greater pool of intra-musular creatine for our muslces to draw from for those initial moments of explosive muscle contraction. Chemistry aside- I took two scoops of Women's Elite pre workout drink about a half hour before my heavy upper body strength training day. The meat of this workout is a heavy dumbell superset of bench press and one arm rows. Hitting the opposing muscle groups back to back is a great way to maximize my workout window, but it is also tremendously demanding. This is where my favorite aspect of Women's Elite kicked in. During my sets of 6, the weights really start to get heavy starting with the third rep. After taking Women's Elite pre workout, I noticed that the weights were just coming up a little easier through the middle and latter reps of my sets- and this is a day where i actually increased my weights! I have to say even though I had never tried Promera's original con-cret product, my experience with women's elite may convince me to purchase some. Other members of the BPW panel used PWE for cardio days, but i passed, because I like having BCAA's and stimulants before cardio, as they help me perform better for those longer duration activities. The panel reported back nominal results during treadmill and bike workouts, which is on par with what I expected. The short story is that Promera's pre workout for women is great for weights, not so great for cardio. Value is where the panel struggled a little bit. It is tough to get over the small serving size, but then again the price per serving isn't that unreasonable at $1.04 (on their website at least). It's also tought to get over the fact that this is almost literally a creatine-only product. If you are expecting to see a leaner, 'dry-er' physique while taking this product- than you are going to be dissapointed. The thermogenic effects that black pepper and capsicum are meant to provide is nominal at best, as there just isn't that much if it in here. You will see muscle gains, and yes, some weight gain, but everything is relative to your goals. I love taking creatine because it helps me reach my personal strength training goals. Others might not because they have other goals that are more...cosmetic. Some panelists wouldn't take it because they hate creatine. I argued that con-cret causes less bloating, but it fell on deaf ears. The package and label of Women's Elite is pretty slick. I think that the 'construction worker' look actually looks better in pink and black than it does in the company's signature yellow and black. I also like the fact that this label doesn't have tons of busy, crazy graphics. It's relatively simple, and looks good. In summary, this is a solid product, but it's essentially just Promera's con-cret with a pink label. If you want to try con-cret, you're better off just grabbing the standard 'mens' version.